What is the biggest problem threatening the Jewish People today? It's not intermarriage. It's not Conservative or Reform. It's not Open Orthodoxy (whatever one's views of that movement, at the end of the day it's a relatively tiny number of people). It's not the Agudah Convention's condemnation of Open Orthodoxy. It's not open-mindedness or closed-mindedness. It's not the singles crisis or even the terrible problem of child abuse. The single biggest problem threatening the Jewish People today is probably Iran. But that's something that most of us are not in a position to do much about, save for voting for those who adequately recognize the threat. So I'd like to move on to discussing the second biggest problem threatening the Jewish People today: the economic crisis in the Israeli charedi world. This is something that the Israeli charedi world itself is screaming about being an unprecedented catastrophe - a banner headline in the Israeli Mishpachah magazine described it as nothing less than the utter financial collapse of the charedi world. There are children who literally do not have enough food to eat. And abject poverty brings all kinds of problems in its wake. Mishpachah reports that there are hundreds of girls who are not entering shidduchim because there is no money to marry them off. Poverty in the charedi world leads to illness, to loss of shalom bayis, to theft. But it's worse than that. Much, much worse. The charedim blame this problem entirely on government ministers Yair Lapid, Naftali Bennett, and also on wealthy Americans who are not adequately bailing them out of this crisis (see this article at The Jewish Worker). But of course the real cause is that so many charedim choose not to work. The charedi community sees it as their right and even duty to largely avoid work and to be supported by the rest of Israel (see this letter explicitly making this point). But the rest of the country cannot endlessly support a community that is underemployed and rapidly growing. The longer that it takes for the government to put on the brakes, the greater the eventual catastrophe. The consequence of the charedim failing to correctly identify the cause of the problem is that things could get vastly worse. As far as the charedim are concerned, there is no need to solve this by looking for employment, or by giving their children the schooling and desire to work for a living. Instead, this is a problem that should be solved in the next national elections. If Lapid loses seats (which will probably happen), the charedim can again join the government, offering to go along with whatever policies the next prime minister wants, provided that he gives lots of money to them. In the short run, whoever runs for prime minister finds this very helpful. In the long run, it's a disaster. The economic crisis in the Israeli charedi world does not just threaten charedim. It threatens the entire State of Israel. It's not just a problem of poverty, as the charedi world claims; rather, it's a problem of people not being employed. This is bad enough when the charedim number about 15% of the population. But what happens as their numbers rise, with their far higher birthrate than the general population? At the moment, fully one-third of the first-grade students in Israel are charedim, and it's a proportion that rises every year. What happens further down the line, when this is not one-third of first-graders, but one third of adults? What happens when a third of Israel's Jewish population not only does not serve in the IDF, but also lacks professional employment and does not even have high-school matriculation? Does anyone think that the economy and the country itself can survive?! I've heard several people argue that this problem is declining with the rise of charedi college programs. But a frightening article at The Times of Israel entitled Deceptive Statistics on Charedim shows otherwise. The rise in the share of charedim who are studying towards a degree can mostly be attributed to women, who are in turn mostly only in the field of education. Most men don't attend college and don't even have high school matriculation. In the last decade, the proportion of charedim whose secular education goes no further than primary school rose from 31% to 47%. Even if such people want to acquire training and professional employment later in life, they are almost entirely incapable of doing so. Their parents have crippled them. All this is not only a terrible problem from an economic perspective, but also from a Torah perspective. Chazal wrote about how it is better to seek a lowly trade than to cast oneself on the community for support. Chazal states that one is obligated to teach one's child a trade such that he can be economically self-sufficient. The charedi world started with a temporary override of these principles in order to rebuild the losses of the Holocaust, but has now proceeded to entirely dismiss these directives and to adopt fundamentally opposing values. They have completely deviated from the mesorah. It's not at all easy to figure out how to solve this problem. But the first step is to acknowledge its severity and cause. Does anyone know if it was discussed at the Agudah Convention? There's a phrase I hate: "Too big to fail". In 2008 we were told the US government had to bail out GM and Chrysler along with multiple banks and investment houses because they were "too big to fail". The economic impact of allowing all these massive institutions to crash would be too much for the world to bear. So here we are in 2014. GM is once again floundering, the investment houses are still playing with other people's money way too liberally. Nothing has been learned, very little has changed and we wait for the next crisis. Perhaps one might suggest the same for the Chareidi community. We don't want them to crash and burn. We don't want to see hundreds of thousands of starving Chareidim, adults and children, wandering the streets like a foreshadowing of the coming zombie apocalypse. But honestly, will anything else change what's happening? Do we keep throwing money at the problem which only delays the inevitable? I was not at the Agudah Convention, but I would presume if anything about this topic was discussed there it was probably more about ways to keep the current situation going like Adopt-A-Kollel and other kick the can down the road ideas than real solutions. "Does anyone think that the economy and the country itself can survive?!" Do you think the charedi world cares? Do you think they've even considered the issue? Answer: No. The economy, and the country as a whole, are too "goyish" and thus nothing to worry about. And they'd be dead. But I seriously don't think they consider any of that. A lot of assumptions and extrapolations have been made regarding the future. We must remember that most Jews abandoned traditional "Orthodox" Judaism in the past, including many who were part of the elite yeshivah world and the famous Hassidic courts. This happened because of a major crisis in Europe which was economic, social and aggravated by massive external antisemitism. If there is a big crisis in the Haredi world, large numbers of its young people will leave, with many becoming quite anti-religious. Over at Cross-currents, one the people who posts there claims that can't happen nowadays because supposedly Communism and Reform Judaism have lost luster so they won't attract many young Haredim. I would say maybe these won't but there are always new trends and ideas that may indeed attract ex-Haredim. Another point to remember is that I do not believe that the Haredim will have the political leverage n the future that they had in the past. Up until the last elections, they were often the swing vote between Left and Right. Although the Left was traditionally not friendly to the Haredim as was the Right, they would justify massive concessions and hand-outs to them on the basis that "we need their support for the 'peace process'' The peace process no longer has any believers in Israel and the mainline supporters of the Left will be much less inclined to support for making large-scale concessions to the Haredim, and neither will the Right because the money and political support among the population is no longer there. It must be remembered that there have been other special-interest groups in Israel that used to have the government over a barrel, particularly powerful trade unions like the electrical and port workers and other Histadrut entities. These have largely been broken (the port workers are currently under fire) because, again, the money simply isn't there to keep them going like they have in the past where they kept claiming that "the government HAS to bail us out". Finally, as I have stated here before, no ideological/political/social system can long endure if it denies reality. Thus, I believe that many young Haredim will wake up and realize that things are not the way they were told they were and they will do something about it. Even if the number of men enrolling in Haredi vocations programs has declined (I am not sure that is really true) due to an ideological back-lash, Hagai Segal pointed out in Makor Rishon that the same happened with National Religious youth going into IDF officer training with numbers declining sharply after the Gush Katif expulsion, but it has gone up again......reality eventually kicks in and Segal says the same will happen with the Haredi vocational programs. "with many becoming quite anti religious" - I don't understand this reaction in those who leave. To me it means they were not believers all along, but we're just going along as the lesser of the evils. If they were smart, instead, they would move slightly away, develop and further their education, and become the smart alternative to poverty and all it's personal ramifications. Someone has to stand up and tale a lead in presenting this path as "Torah true" an ideal for those less inclined and financially able to "sit and learn". You have hit the nail on the head. I don't know how many exactly, but a non-negligible percentage of Haredim, especially among the younger generations, are Haredim only because of the extreme familial and societal pressure which is the norm in that society. The lack of any sort of hashkafah/emunah in their education leaves them living a "Torah" life without any idea or ability to explain why. That's why the leaders try to maintain the extreme isolation of the community. When on an individual basis, the cognitive dissonance becomes so great that it exceeds the pull of the familial pressure, the individuals leave the fold, and, outraged at having been sold a complete lie, become rabidly anti-religious. (Remember that dati-leumi is not "religious" according to the definition they have learned, so they are unable to distinguish them from hilonim.) When this happens on a societal level, woe betide them. Agree with Neshama, those who would even contemplate leaving the Torah way of life never really had any emunah in H', or like the comment by Yechiel were just following the daily rituals they were brought up with. But, do not agree that the Rebbes (leaders) keep them insulated for the reason Yechiel brought up. Believe that the Israeli society has become so morally bankrupt that these religious youth would or could easily be corrupted if they weren't isolated. Before things got so out of hand about two or more decades ago, life for everyone was simpler and still more normal with less hatred between brothers. Societies are created and manipulated by the powers that be, always with an agenda. That agenda being, breaking down the religious way of life for all Jews. Wouldn't a good first step be to drop the criminalisation of charedim refusing the draft and focus instead on improving their economic output? I agree - at the present time, with the charedim feeling (rightly or wrongly is irrelevant) under attack, they are just going to become ever more determined not to "give in." If the government would stop the overt attempts to change them, at the same time limiting their financial support, things would quickly change. a) like Iran, haredim won't change until they are forced into change. b) the proof is in the pudding: the problem of haredi lack of education and the resulting poverty is hardly new and yet not once have you heard any calls from the haredi leadership calling for an educational reform to solve the poverty problem. quite the opposite in fact. so there you have it. thank G-d for Lapid because only because of him will haredim be saved from poverty. Nothing has changed because nobody has ever tried to change the charedi state funded curriculum. Fighting wars of ideological purity to conscript ten thousand unemployables is shutting the stable door ten years after the horse has bolted. Instead we should leverage state funding to increase hours of employment skills so we give these boys a chance. For decades these boys have been sacrificed as cannon fodder in a Faustian pact between secular politicians forming coalitions and religious politicians intent on maintaining their constituency. Don't imprison then for the foolishness and self interestedness of their leaders. The Education Ministry just announced that they will require the teaching of evolution as a core subject for everyone in seventh to ninth grades in all state and state religious schools starting next year. Things like this are the reason the Charedim aren't willing to give up even a tiny bit of control of their curriculum. Teaching this subject in early high school serves no real practical purpose; it's not going help anyone get a job, but it will confuse and undermine the faith of allot of religious children since they don't have the intellectual maturity to deal with the subject. Whether or not it's true is besides the point ( and I'm sure most people on this site including myself accept some variation of evolution / common ancestry ). It would "undermine the faith" of someone whose religious education was simplistic and otherwise lacking. Of course poverty isn't the problem. It's the culture which creates the poverty, which is to blame. The continuation of an unsustainable movement fosters the problem. The sooner a compromise is made, the sooner the situation will improve. The chareidim must begin to accept that there just isn't enough money to keep supporting a large, growing segment of the population. It is sad that the leadership has been granted the infallibility of sainthood as long as they say what their adherents want to hear. As long as one radical leader clings to the current system, that leader will maintain a following. The only way to resolve the issue would be for all the leadership to agree on a compromise, and that will never happen. When Rav Shteinman tried to be less radical than his colleagues, he was lambasted by the chareidim. Unfortunately, the government will have no choice but to act with force to solve the problem. "The economic crisis in the Israeli charedi world does not just threaten charedim. It threatens the entire State of Israel..."
True, in the long run. But it will hit a wall within the charedi community much sooner than the ripple effect on the entire country. The charedi community will have to find its own solution first. You and I know of someone in the charedi community who agrees the hora'as sha'ah of Eis la'asos Hashem has to end, and that the dam is about to break (his words). "I've heard several people argue that this problem is declining with the rise of charedi college programs. But a frightening article at The Times of Israel entitled Deceptive Statistics on Charedim shows otherwise. " But it was happening on its own. We are familiar with the concept of gadol ha'metzuveh v'oseh m'sh'eino metzuveh v'oseh - because once something is an obligation, there is more a tendency to resist. People don't like being told what to do. If Lapid had kept his mouth shut, the trend would have continued to rise. As long as large sections of Orthodoxy continue to live in an imaginary past and deny the realities of the present, such issues as army or national service, core curriculums of essential general knowledge for all religious schools, entering the workforce and decreasing the debilitating poverty and dysfunction of so many families, will never be able to be addressed properly. This crisis of the chareidi world in israel is self-inflicted and it will only be solved by the chareidim themselves. Two hudnred years ago, when the chareidi jews of Europe started returning to Eretz Yisroel, they survived mainly on the "chalukoh"- the charity from the jews in europe.This is how the Old Yishuv survived. Very few worked and when some jews started agricultural sites (like Petach Tikvah) they were met with great hostility. So, this attitude-"I deserve to be supported by the rest of the world"- became ingrained and now, thanks to generations of kollel life has become the mantra of the chareidi world. Thankfully, the chareidi world in the United States and elsewhere did nto fall into this trap. Many (most?) chareidim in the US work. Yes, they often manipulate the system but, by and large, they go out and work , even if they have learned in kollel for some years. The chareidim in Israel will have to understand that work is the norm- not kollel. Even if they shun secular studies- what happened to good old-fashioned manual work/ Electricians, plumbers, builders, gardeners, here in the US, the chassidim use these ways of making a living. What happened to this way in israel? In USA a good plumber, electrician, HVAC or auto mechanic makes an excellent living and can support a haredi lifestyle. Not so in Israel. Hassidim practice וקנהו מיד עמיתך and give each other an opportunity to earn a living. For example, I'm told that on a single zone ductless AC installation in Israel one makes $100-150, I know that in US the profit starts at $500. Also, in US good tradesmen are respected for their skill and earning ability. Actually, I believe that the intelligence required to be good at these trades at professional certification level is greatly underestimated. Carol, don't overlook the much lower economic status of "most" Israelis. Even retired Olim from America cannot afford such high expenses. That's why there is the earning differential. Not a fair analysis. The question was why don't hassidim work in trades in Israel like they do in US. The answer is because in Israel these trades cannot support a chareidi lifestyle whatever the reason is. What you are saying is correct, but will not get them into these trades. This is the main reason, IMO, that charedim shun work - working in Israel doesn't allow them to support their lifestyle. This is why work is held in low esteem by them. It's all about money. I wonder how many people going on the Safari earned their money working in Israel? Carol: I fail to understand your point. Are you seriously saying that in israel plumbers (installators), electricians, builders, etc...do not earn a good living? How do you think the tens of thousands of people who do this live in israel? I am not even sure what you mean by 'chareidi lifestyle". Usually ,this lifestyle is lower than other lifestyles! The fact is that the only reason why the mass of chareidim (especially non-chassidim) don't work is because they have been hoodwinked by their leaders in their present life choices..
Haredim lifestyle involves having a large family, paying tuition and marrying off your children, which in Israel includes paying for half of an apartment. Only in first world countries the tradesmen working with their hands earn six figure salaries. Israel is not a first world country. The tradesmen in Israel face competition from cheap Arab and immigrant labor, they are not well off. This is simply the way it is, I'm not saying to blame anyone. My daughter graduated from Ofakim Seminary with BAs in Judaic Studies, Math and English. She was lucky to find a full time job teaching English in a Shas school in Dimona. Her salary was $500 a month. Don't teachers make a good living in Israel? You be the judge. Carol: Teachers are one of the most shamefully low paid jobs in the country, much less than other educated professions and certainly several (if not many) times less than a good electrician. Part of the problem, as pointed out in this article, is that so many of the Haredi women learning in these programs become teachers, which is essentially an impoverished profession in Israel. This is a national shame. Nonetheless, there are other choices one can make if their goal is to make a good living. A factory certified Carrier technician comes home with $2,000 a month after tax. To marry off his children he comes to the US to shnorr. In the US his son comes home with $2,000 a week and struggles with 5 children. These are my real neighbors from BP. Somehow this fundamental problem is mostly ignored in our discussion here. Am I the only one working to pay the bills? Isn't it clear that a normal(6-8 kids) family needs $200,000 a year? I'm not saying that it's right or wrong, just that this is the way it is. Guys in Flatbush have education so that they don't have to do trades. I have a neighbor, a Litvishe talmid chochom, who is an electrician. Now he has ten(yes 10) kids, he learns in the morning and starts work at 11 am. He owns his own house and pays his bills. This, I believe, is possible in first world countries, not in Israel. If you can earn $100,000 in Israel, this is fantastic! I wasn't smart enough to do it! Anyhow, I want to rest my case. Anybody can take a family of 6-8 children and plug in the numbers that he thinks are realistic. The resulting income is very hard to earn in Israel. Of course it was discussed at the Agudah Convention. And in the clear headed and decisive way that the Agudah Convention is known for, they decided to strongly encourage all Israel Charedim to at least earn a Bagrut. Some of the brightest should also enroll in Hebrew University. And I have a bridge to sell. Very cheap. "But the first step is to acknowledge its severity and cause. Does anyone know if it was discussed at the Agudah Convention?" It is the women who are pivotal in perpetuating this system. It is women who decide where their children go to school, and it is the women who decide the rankings of shiduchim (like here: http://www.mabtim.com/). It is the women who say, "I don't need my husband to support me, I can support him learning Torah." It is the women who say, "I want my son to only learn Torah, to be involved in Kodesh all day long. Hashem will help." It is the women who say, "I don't want a girl for my son if her father works, even in Chinuch." Note how Chareidi girls' education is actually at a pretty high level, and there are many academic programs for them to choose from, including those where they graduate with a full-fledged university diploma. Women feel that they can do it all, and then they get to choose what their husbands and sons do. And their choice is Torah. The women have simply been brainwashed in this direction by their teachers throughout school. It's been drilled into them that the only husband worth having is one who is in long-term kollel, and that their children must receive a "pure" Torah education. Women can't do it all - women in Judaism have a job - to be mothers, and this is one big reason that woman can't be chayav in Mitzvos Shel Zman Grama. Go to Lakewood, you'll find a row of tiny babies laying in car seats, with their bottles propped up with a blanket! It is interesting how the Haredi community, which prides itself on its "traditional values" has completely overturned the traditional Jewish family structure by making the women the ones who "wear the pants" in the family, reponsible for parnasah and dealing with the outside world, in addition to the old maternal values and obligations. I am amazed that they are not crushed under the burden. Clearly, it has been drilled into them, but the ones doing the drilling are other women. Their teachers are women too. Yes, Y.B-D, they are crushed under the burden but they take pride in the hardship. Yes, RMP, women can't actually do it all, and yes, it is the children that are affected. What price will be paid for that in later generations? Good question. There is even more irony: all of this was made possible by feminism, and by the Bais Yaakov movement, which placed values in books above values of the family. It is the women who are educated that their portion of olam haba is determined by how much Torah their husband learns. It is the women who are told that a household with a husband learning full time is the way to make the house spiritually safe and raise frum kids. It is women who are repeatedly given the message that koveya itim is the compromise bdieved option for people not righteous enough to have emuna that Hashem will take care of them. Women want to be good jews, too. The definition of good jew that they're taught is a woman who dresses modestly whose husband is a talmid chacham. And talmid chacham of course is only someone who learns full time. As the wife of an Avrech in Kollel whose stipend has been almost completely cut, I would like to respond to the news that was reported about the poor status of Avreichim. I am writing with tears because I look around and I see that people have no idea. They don't know what we are dealing with every day. I am certain that it has been many years since Jews have been required to show this much dedication to Torah and supporting a house of Torah. My Husband is an Avrech who is a Tzadik, he learns all day and excels, yet, in spite of all this, he has no stipend except the bare minimum - and people around don't know. Everyone is enjoying life and we are living in real poverty. I don't want to be poor, to have to ask for money, to become someone who needs help, but this is what is happening because we want to preserve a house of Torah and only Torah. If people now know what the families of the Avreichim were going through, it is a little bit better. I have to say I don't understand what this woman wants. She can't have it both ways, she says that she doesn't want to be poor, yet she wants her husband to sit and learn all day. Well guess what, money doesn't grow on trees. She and her husband have made a choice and now need to live with it. Learning torah was never meant to be an occupation and a way to make a living. She is poor by choice and should not be blaming other people. Her comment that everyone else is living it up and enjoying life while she and her family suffer in poverty is particularly galling. People who work, work hard for their money and sacrifice a lot to do it. No one owes her or her husband anything. See my post here to see the original letter. It reminds me of a line in a story I once read- the woman is told that her son's shidduch prospects are weak because he works. "You see, Mrs. Kleinman, the girls are taught that they must sacrifice. So they're not happy unless they're sacrificing." "Can't they give that up?" "No, that's the one thing they won't sacrifice." Kira, I think you're on to something. Maybe this kind of pressure in the chareidi community comes mostly from the women. I don't think it comes from the [chareidi] gedolim, in their personal advice to individuals. I'll mention here a true story. My neighbor, Y. Cohen, went to see Rav Elyashiv over twenty years ago, and he asked what to do about his overwhelming financial situation. This might come as a suprise to many people, but it's a true story: Rav Elyashiv said to him, "Where does it say in the Torah that you have to learn all day?" This story was related in a Gemara shiur before 15 other avreichim and the maggid shiur, and no one protested or bothered to try to bring sources to the contrary. 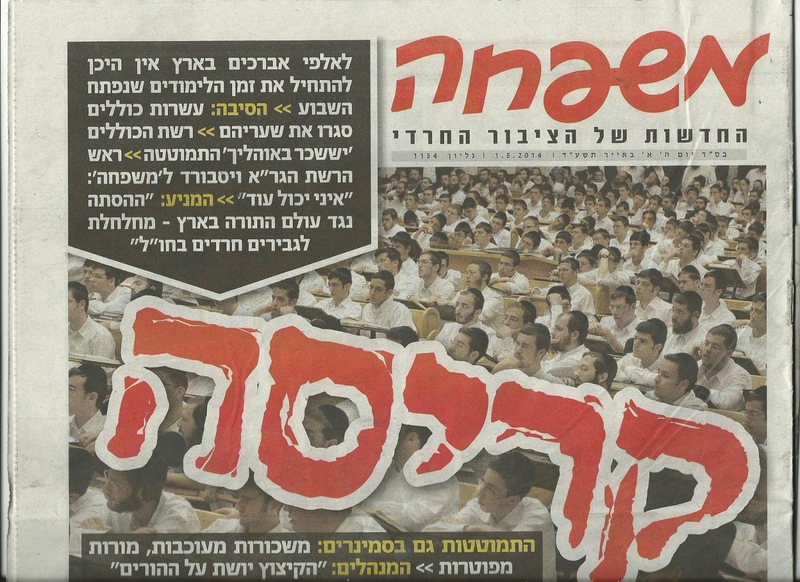 As a matter of fact, the maggid shiur repeated this story recently with regards to the current government decrees, while he was making the point that historically there never was full-time kollel for everyone (and this maggid shiur is a talmid of one of the gedolim in Bnei Brak, Rav Dov Landau, who is considered a talmid of the Cazon Ish, and he also studied in Brisk for six years, i.e., not a modern-leaning rav at all). > The women have simply been brainwashed in this direction by their teachers throughout school. Everyone is acculturated. At what point to we expect people to take responsibility for themselves? At what point do we have enough respect for them to see them as people with their own minds, and not just programmed drones? It's difficult, maybe impossible, to tease out all of the influences on someone's decisions. And it's probably true that our decisions aren't nearly as much within our rational control as we would like to think. But these women (and men) are responsible for their own choices. People are responsible not only for their own choices, but also for how those choices affect society at large. For example, making a slightly fancier wedding than one's neighbors is a personal choice, but it will also affect the expectations of others in the community. If I am indeed on to something, than the solution to the problem must come not from criticizing the Gedolim, not from Halachic arguments, but women of stature who declare, for instance, that they are not willing for their daughters to bear that burden any more. That there's no "Yerushalaim shel Zahav" at the end of their story. Thank you for that point. I hate when people pull out the "brainwashed" card. In any debate or discussion anyone can claim that the other side is brainwashed; it means nothing. To the extent that our decisions are influenced by our nature or nuture, such influence cannot be said to be more or less (only different) for any group. A reminder: Anonymous comments will not be posted. Use (preferably) your real name, or (if you're afraid and lack bitachon) a pseudonym. I certainly lack bitachon in school governor's commitment to open discussion. Kira makes a good point. Many women buy the "Talmud Torah kneged kulam" idea hook, line, and sinker. They think their husbands are really doing something tremendously holy by debating pilpulim on sugyos that have no apparent application in everyday life. I wonder if they have any idea what their husbands are actually studying. Either way, the fact is that if women weren't willing to sacrifice, the men would have to find work (if they wanted to get married). The problem only needs to be postponed until some time in the medium-distant-future that Israel is able to reach and draw up large amounts of fossil fuel on an efficient and profitable basis. Iran is not a number one threat. Hyperbole doesn't get anyone, anywhere. Also, considering other strands of Judaism, such as Conservative and Reform as a threat or problem, is astoundingly insulting. "Also, considering other strands of Judaism, such as Conservative and Reform as a threat or problem, is astoundingly insulting." Yeah, in the same way that your not accepting Jesus is a tragedy. You can only consider it a tragedy if you're absolutely certain that you're right and they're wrong. It can only be a threat if you're absolutely certain that you're right and they're wrong. But, since no one can prove anything about religion with any certainty, to be absolutely certain that you're right is arrogant, and to dismiss other's beliefs and label them a threat is insulting. G*3, no one can prove anything with absolute certainty. Many, (most?) Orthodox Jews believe in Orthodox Judaism with substantial certainty. From the perspective of Orthodox Judaism, fellow Jews subscribing to the theological tenents of Conservative and Reform Judaism is indeed a tragedy (albeit not as much of a tragedy as being lost to assimilation altogether). Everyone has some beliefs that they hold with substantial certainty such that they dismiss conflicting beliefs and view them with disdain, sadness, or fear. In the case of non-Orthodox Judaisms my point of view is sadness. I, for one, do not feel insulted by the notion of Christians viewing my rejection of Jesus as a tragedy. Of course they would view it that way. As long as they don't actually force me to accept him or persecute me for not accepting him, I have no issue. Iran is the number one threat because they are an existential threat. The threat of an actual war with Iran might be small but it exists. you want the charadim to get a secular education in Israel look what the secular are learning Darwin and other philosophies. the same Hashem who provides for Am Yisrael will continue to provide. So why are charedim so worried about Lapid? Oh, for goodness sakes. All they're being asked to study is some high school math and as much English as you, Chaim Dovid, appear to be able to write. That is all. Science isn't even on the curriculum, much less evolution. It is not about "secular education," it is about basic skills that are value-neutral. This is not 200 years ago, or 50 years ago, and it is not the same battle. They're fighting the wrong war with weapons that failed back then also. Darwin isn't philosophy, it's science. kira writes "This is not 200 years ago, or 50 years ago, and it is not the same battle. They're fighting the wrong war with weapons that failed back then also"
that is a very good point that is often missed. the charedi attempt to protect judaism failed in a big way. all of the jews practicing judaism today are the physical and spiritual descendants of the maskilim of yesteryear. the sforim that are used where produced by the maskilim as well. of the culture of the chasam sofer, vilna goan, etc., nothing remains today, while the religious jews of today are all busy studying moses mendalson's commentary on chumash. it can be assumed just as the maskilim of 200 years ago where indeed the future of judaism (while the charedim of 200 years ago have disappeared), so too, the charedim of today will disappear, while only the rationalist maskilim will succeed in raising new generations of jews that are loyal to hashem and the torah. Are you suggesting that the 85% of Jews that do not keep Shabbat is the resounding success of the policies of the Chasam Sofer? I'm not sure that he would thank you. Would you like to try again and see if the retention rate is better this time around? The success of the 20th century needs to be replicated, and nourished, not destroyed. And I am pretty sure that teaching algebra or English in high school is not on the list of Yehareg Ve'Al Yaavor. a reader, most Jews today aren't frum. Ergo, the maskillim won. "with many becoming quite anti religious" - I don't understand this reaction in those who leave. To me it means they were not believers all along, but we're just going along as the lesser of the evils. This is an interesting question. The fact is that the founder of the viciously anti-religious Soviet "Yevsektsia" which was the Bolshevik Jewish organization which devoted itself to uprooting all Jewish observance in the 1920's and 1930's in the USSR was founded by a person who had semicha from one of the pre-Holocaust Gedolim in Europe (he was later rewarded for his efforts by being exectued by Stalin in the big purges of the late 1930's). Writer I B Singer writes of his days in the coffe houses of Warsaw in the 1920's where young Jews, fresh out of the Batei Midrashim and Hassidic courts of Poland had become Bolsheviks and were drawing up death lists of whom they were going to have shot after "the Revolution". The founders of the anti-religious MAPAM party in Israel grew up in Hasidic families. Why is this? It seems it is easier for someone to slip out of on extremist ideology to another, even opposite extremist ideology, than it is to go from being an extremist to being a humanist moderate. Maybe it is related to certain personality types who just like being extreme and some Haredim streams emphasize ideological purity over humanism (accepting that people are different and working with them on that basis, even if you want to convince of the correctness of your views). Thus, there were many who remained the same person, they just shifted their anticipation from the arrival of Mashiach ben-David to Mashiach ben Lenin v'Marx. If someone is educated that what is important is identifying with a certain Jewish religious group and maintaing conformism within that group is the most inportant thing, rather than identifying with the Torah and the Jewish people as a whole, then intolerant negative character traits are magnfiied, rather than educated away towards tolerance. The problem is much more complex than simply one of convincing kollel people that they should work for a living. See my latest post R' Shteinman: No degrees for girls even at the expense of losing large amounts of funding. Even with the economic crisis all around them, will not allow anything to be done to alleviate the problem. "The women have simply been brainwashed in this direction by their teachers throughout school. It's been drilled into them that the only husband worth having is one who is in long-term kollel, and that their children must receive a "pure" Torah education. " An understatement if I have ever heard one before. ;-) Would you like to talk about the general insanity (not to mention conflicts of interest) of the wonderful world of shadkanus? English speaking, Ashkenazy women being the most insane, from my experience. Anyone want to exchange horror stories? Please direct me to links of your on this topic, if you have written on it. "All this is not only a terrible problem from an economic perspective, but also from a Torah perspective. Chazal wrote about how it is better to seek a lowly trade than to cast oneself on the community for support." This is all very well, but, in reality, it is not possible to support 8+ children at a decent standard of living in a "lowly trade", especially if you want at least one of the parents to have adequate time with their children. All this is especially true in Israel. That is to say, it's about more than just getting an education and job, it's about generally getting a grip and realising you live in the real world and not fairly land. "... it is not possible to support 8+ children at a decent standard of living in a "lowly trade"..."
I really don't get this objection. Say it's true (it probably is). Are you telling me that under the status quo it IS possible to support 8+ children at a decent standard of living as a full-time learner? You don't think that even the meager earnings from a lowly trade would still be more than the bone-crushing poverty in which many families find themselves? That's delusional. Not to mention that the Mitzvah of Peru u'Revu requires two children, not 8. Expecting other people to pay for your Hedurim or, more likely, complete lack of discretion, is also a Mitzvah. Only Charedim forget that the Lo Sa'asehs are Mitzvos too! This is the biggest problem threatening the Jewish People today. "If Lapid loses seats (which will probably happen), the charedim can again join the government,"
Israel's economy grows at least 10% annually. Do the numbers of charedim grow more than 10% annually? If not, then how can you say this is not sustainable? Reb Yid, where do you get your numbers? As far as I can tell, Israel's GDP never grew at that annual rate! You'd have a hard time finding any country with that kind of GDP increase- unless under some strange exceptional circumstances. Perhaps, you're taking about overall numbers that don't take into account population increase? Does this 10% figure take into account inflation? You are assuming the Israeli taxpayer will continue to fund the Haredi community's Kollel lifestyle indefintely, even if the economy is growing. It is under no obligation to do so, just as a Jew is not obligated to give large amounts of tzedakah simply to anyone or any institution who asks for it. This is learned from the halachot of "Terumah" which is given by the farmer to the Kohen. As I understand it, the farmer can give it to any Kohen he wants and is not obligated to give it to the first Kohen who asks for it. Secondly, there is a real danger of an underclass developing....people stuck in a cycle of poverty, with no education and no prospects of getting out of their situation leading to great embitterment and social pathologies. This ends up feeding on itself. The black community in the US suffers greatly from this and a large white underclass is now growing rapidly as well, threatening the very economic and social infrastructure of the US (see Charles Murray's excellent book "Coming Apart"). We don't want this situation in Israel. Telling people that it is a "mitzvah to study Torah in poverty" might be a noble pursuit for a MINORITY of people, but there is no way this can be pushed on a whole community which will INEVITABLY lead to a large number of people dropping by the wayside which would be a burden both on the Haredi and general Israeli communities. The Kollel lifestyle was never meant to be appropriate for most Jews. ונסיון העוני קשה הוא מאוד ולאו כל אדם יכול לעמוד בה וכארז״ל וכארז״ל בידיו את האדם על דעתו ועל דעת קונו, (עירובין מא:) דקדוקי עניות מעבירין את האדם על דעתו ועל דעת קונו, וגם כשיראו בנ״א איך שהת״ח שרוי בעוני ומחסור לא יערב לבם לגשת אל עבודת הקדש, ואשר על כן אמרו (שבת קיד.) כל ת״ח שנמצא רבב על בגדו חייב מיתה שנא׳ כל משנאי אהבו מות א״ת משנאי אלא משניאי ופרש״י שהבריות אומרים אוי להם ללומדי תורה שהם מאוסים ומגונים נמצא זה משניא את התורה, וכן מצינו באאע״ה שא״ל הש״ת ואברכך בממון (רש״י פר׳ לך), שזה היה צורך לו בכדי שיוכל לפרסם אלקותו יתברך בעולם וכמ״שבגמ' (סוטה דף י) א״ת ויקרא אלא ויקריא. I think you need to be more specific. Perhaps you mean the biggest economic issue in Israel. Why is this "The Biggest Problem" for Judaism? How about the fact that there are millions of Jews who desecrate Shabbat each week? Is it not possible that that is having a more negative impact on the Jewish nation? Rabbi Natan, come on lets have some straight talk - you know as well as I do that if you can write a 5 page monograph against the Kollel establishment & on the importance of working for a living together with all the relevant sources, I can write a 10 page paper, again, with all the sources that prove that Torah study is in a league of its own and supporting those who wish to learn has great halachic underpinnings. Who are you trying to win over with your almost daily rants? Ohsie? Elemir? Temujin? Come on you know that the strong 6000 in the Mir, most of them haven't even heard of your blog let alone read them. I can assure you that if the Mir would be reading your blogs, you would have 6000 comments daily! The talmidim in the Mir (if they would read your posts) would look at you as another link in the chain of those who have been sonei lomdei torah throughout our golus. Do you really think notwithstanding all your dizzying academic vocabulary in your posts that we cannot see through you as someone whose main issue with lomdei torah is emotional rather rational. Has it perhaps entered your mind that lecturing on Judaism to the world wide web and to a potential13 million jews requires deep understanding of the matzav hador, yet you seem to have no fear in spilling out whatever you personally think. I wouldn't call you evil. I think you have just not yet achieved the maturity to realise the severity of your actions. "The only thing necessary for Evil to triumph is for Good to do nothing at all." That's a paraphrase, because I am too lazy to look up the actual quote, but the sentiment applies. Those who perpetuate the problems in Charedi society are truly evil. This evil needs to be decried because that's better than doing nothing! "I can write a 10 page paper, again, with all the sources that prove that Torah study is in a league of its own and supporting those who wish to learn has great halachic underpinnings." I do not believe that you can show that Chazal or the Rishonim supported the idea of a society raising its sons without the skills or desire to work to support their families and instead to learn and be supported by others. Feel free to attempt to prove me wrong. "Who are you trying to win over?" People who care about the values of Chazal and the Rishonim. And/or people with the sense and honesty to see the unfolding disaster. Your title says the biggest problem facing...you then proceed to discuss what you think is the second biggest problem. Now the truth is Iran is not a problem. Its a gzreira min hashamayim. The economic issue you discuss is also a gzreira. The problem is us. As great as we are as a nation, and as much as we are faithful to Hashem, and as much as we strive to be better in our service of Him, we still are lacking. I do not mean to be mikatrig on Knesses Yisroel but the reality is we need to do tshuva to be mivatel these gzeiros. You have expressed here the attitude that drove most of the Jewish people away from observance of the Torah..... and why mentioning "Zionists" to some Haredim arouses a much greater visceral reaction than does mentioning the biggest antisemites in history. What you are saying is that there is no more reason to oppose and fight against an antisemite than there is to oppose a volcano or hurricane. Just as a volcano is not "evil" neither are the Jewish people's enemies. They just "are". When I read the TANACH I don't see this mentality. The Jews fought for their people and their country, and the often succeeded. It seems that the apparently endless galut of the last 2000 years sapped out natural, healthy instincts for not just for mere survival but for bigger and better things than that. I read once that the Romans considerd the Jews the toughest fighters they ever faced on the battlefield. Tragically, our two wars with them were failures, but we have had our moments of glory, too.....the Maccabees, Joshua's conquest of Eretz Israel, David haMelech, Shaul HaMelech and many others. Even Avraham Avinu was a GREAT WARRIOR and it was for this that the Canaanites were in awe of him, as is seen in parsha Ha'ye Sara. To be frank with you, it is true that some people are attracted by a passive existence of merely keeping one's head down, but times have changed, it is no longer the Middle Ages and most Jews are not going to tolerate being kicked around as happened so ofter in the not so distant past..
(1) What can you do when you have an angry tiger by the tail? Depends on how tired you are and on how fast and far you can run. Isn't the problem in part a superexpensive secular education system that makes people learn alot of unnecessary things? If there was a working aopporenticeship system, then people who decided they wantes to work could work.